Durtle the baby sea turtle gets lost from his mom and dad. Will he find his way back? Fun bedtime story for kids! Create your own customized adult and baby sea turtles that your children and grandchildren will love. Pick out the perfect fabric in their favorite colors to make your new under the sea pets come to life! Your patterns include the story of Durtle the sea turtle. The story is a coloring book so children can color the page and design their own storybook! Makes it even more fun and interactive! - 1 PDF sewing pattern with instructions and pattern pieces to create a 19" plush sea turtle. 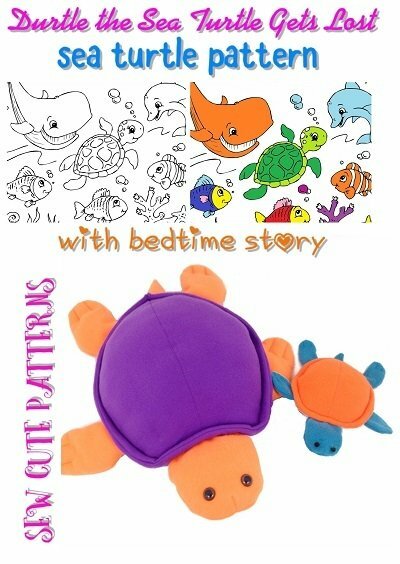 - 1 PDF sewing pattern with instructions and pattern pieces to create a 9" plush sea turtle. - 1 PDF coloring storybook, Durtle the Sea Turtle Gets Lost. 10 pages.